In 2016, about 41 million people practice photography either as a career or as a hobby. Additionally, the world’s most popular photo-sharing platform, Instagram, sees 94 million new photos/videos published to it every day. In short: that’s a lot of photos. And whether you need a photo-heavy website as a designer or blogger or your want to feature photography on a client’s website, portfolios are often the best means of doing that. There are a lot of themes out there designed with photographers in mind. 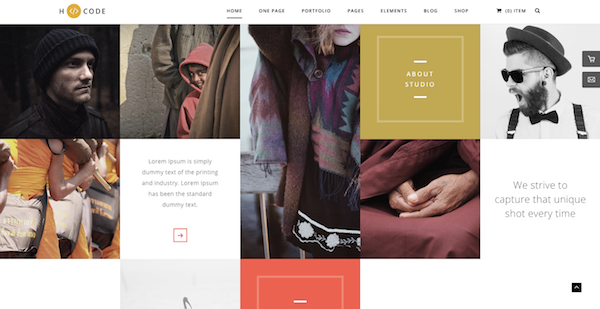 To save you the hassle, I’ve rounded up the best photography WordPress themes right here. Now, as far as how I chose the themes for this list, I used the same criteria professional developers use when selecting themes for their clients. High marks: While the ranking system differs from site to site, I set the basic bar at the equivalent of a 4-star rating (out of 5) or higher. Trusted source: All themes featured here are sourced from ThemeForest, other high-ranking and trusted marketplaces, and well-known developer sites. Retina ready: While this isn’t absolutely necessary, the higher concentration of pixels in retina ready designs are ideal for photographers. Lightweight: I hold demo sites to the same standard as themes: they need to be lightweight and load fast, so your visitors will never have to wait. 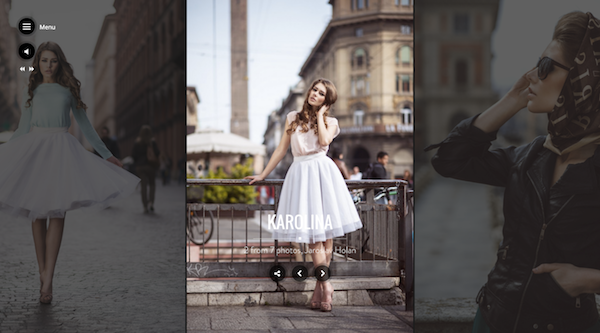 Built-in portfolio: This is the best way to showcase photography, so this feature is a must. Modern: Even if a theme does a great job in showcasing photography, it’s not going to work well with your audience if it looks out of date. Responsive: There’s no longer any excuse for websites not to be responsive. 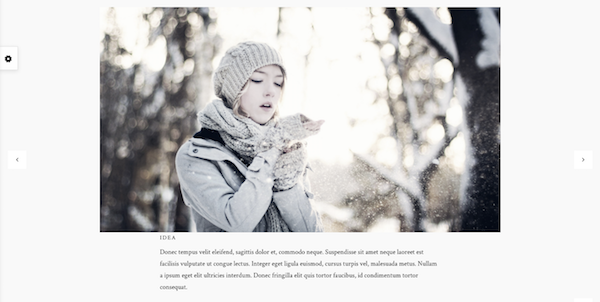 Elegant Themes’ photography-friendly theme is Divi. 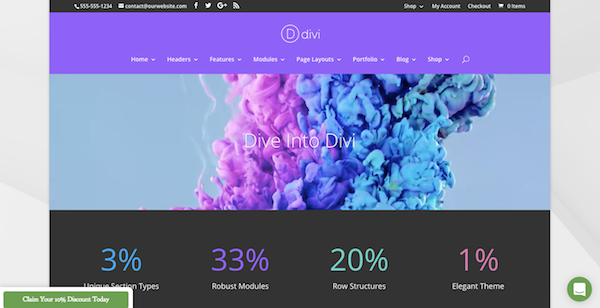 With the Divi Builder and now Divi 3.0’s game-changing Visual Builder, designers and developers have the flexibility to build a responsive theme to showcase high-resolution photography portfolios. With 18 pre-made designs, 46 content modules, and extensive advanced settings, there are countless possibilities here. As a bonus, there are a number of Divi child themes very well-suited to photographers’ needs like Skye and Analog. 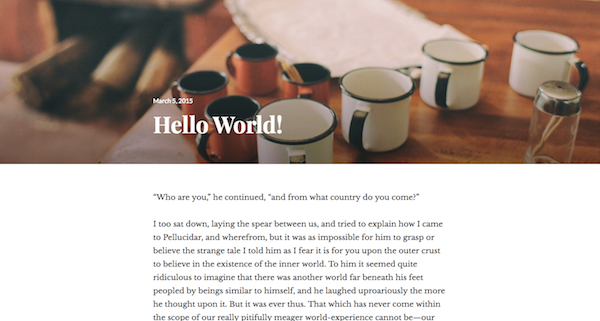 If you aren’t an Elegant Themes member, then we have a lot of great theme suggestions from around the web too, so keep reading! For the developer or designer who wants a clean, simple layout that brings attention right where you need it (i.e. on your photos), check out Avada. You can easily customize every single element in this theme, which means you won’t have to worry about your site looking like other Avada sites. It also works great for a variety of purposes, so it can evolve as your business evolves. There are three initial baseline variations to work with (image background, video background, or content slider) to work with here. Bow also allows for more advanced customization options. Made by “Elite Author” Themes Awesome, Bow is all about giving photographers more control over building a website without overwhelming you. While this theme is a little on the pricier side, it does a great job in putting the focus solely on photography. If you take a look at the demo, you’ll see that it actually comes with several demos, each designed for specific photography niches including children, nature, editorial, and weddings. The dark framing and fullscreen photography, are especially nice touches. Looking for less options and less work without having to sacrifice quality. The Coastline theme provides photographers looking for just that with a perfect compromise between quality and being able to use the theme out-of-the-box. Darkroom is a really straight-forward theme with just enough options to appease the needs of those with a photographic eye. Choose from a variety of background shading to offset your photography. 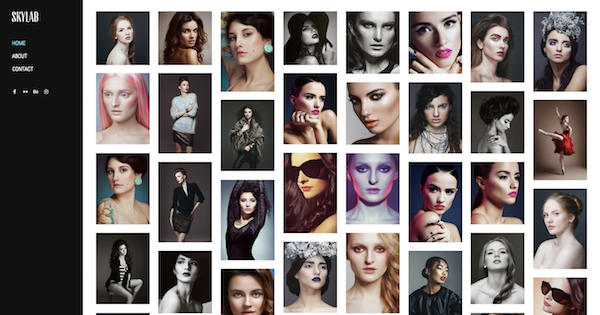 Extensive portfolio layout options are also included here. Just one quick look at this theme and you can tell it was made for landscape and other outdoorsy photos. If you want a simple and really cool way to showcase your fullscreen, high-res photography, this theme would be perfect. You can also add video and audio to this one. Don’t be alarmed by the food blogging “theme” of this theme. That can easily be changed up to suit your needs. For those who are looking for an affordable theme option (i.e. free), the Dyad theme is a good place to start. It’ll also give you the opportunity to talk a bit about your photography as you showcase your work piece-by-piece. 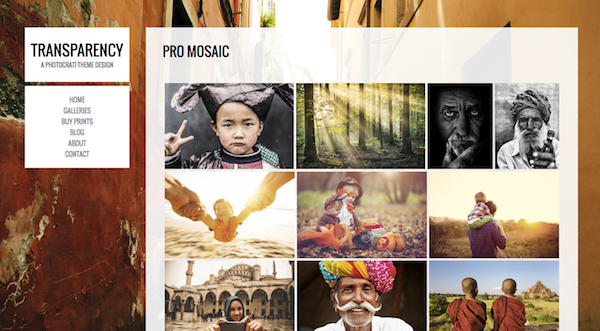 ePix is a pretty cool theme for featuring photography. At first glance, you might not think much of it since it looks like your typical theme with infinite scrolling enabled. 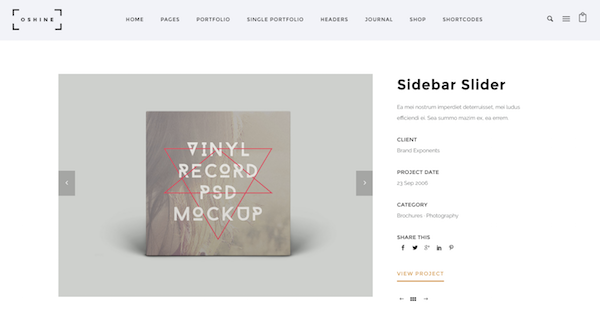 With a closer look into the page types, elements, and galleries though, you’ll see that this theme is a dream come true for those who want flexibility in showcasing their work and/or business. If you’re looking for a website that’ll do more than just showcase your photography, Etudes can help take you to that next level. With a super professional and clean layout, this is the perfect theme for the budding professional trying to establish credibility in their industry. This theme comes with 41 demos which makes it an absolute steal! While only 12 are specifically marked for “photography,” the others would do just as well for showing off your super glossy photos and/or establishing you as a reputable business. This self-described minimalistic theme is much more than that. With different skins, advanced color management, and a variety of galleries to work from, I think this slick theme would be perfect for high-fashion sites, or anyone looking to add an extra touch of class to their design. For those wanting extra flexibility in design, the H-Code theme is the way to go. With pre-made multi-purpose themes available, you can choose whichever style fits your personality best. Chock-full of plugins, this theme takes all the guesswork out of optimizing for social, search, speed, and more. For photography-heavy blogging, a theme like Insight would work really well. While it does give you the ability to showcase your high-resolution imagery, it was built specifically with the blogger in mind. I could easily see this working well for a travel blog. If you’re looking for something that’s super intuitive and showcases your work right upfront, Kappe does a good job of this. With this theme, you’ll never have to worry about visitors having to dig around to find your portfolio. Several demos round out the selection here. 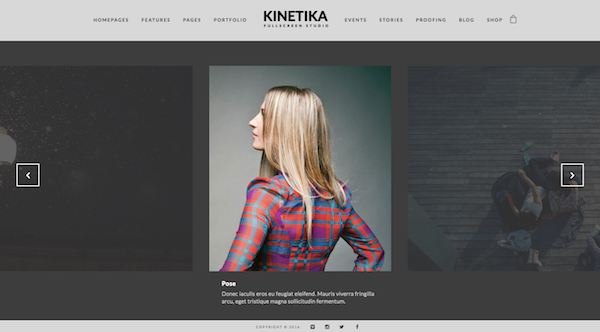 While many of these photography WordPress themes function similarly, imaginem’s Kinetika sets itself apart with a fullscreen responsive design and event posting integration. For those wanting to use their website to increase audience engagement—through social, in-person events, and showcasing retina ready imagery—this is a great theme to use. If you’re less focused on creating pages and pages of content and more focused on simply showcasing your photography, the LENS theme is a great pick. Relying on a minimal and flat design, LENS brings a hint of excitement to your portfolio through unexpected and subtle uses of color and motion. Just give the theme developer’s own website a look and you’ll see what sort of high-quality work and attention to detail they’re capable of. Want to give your website a social media-y look? The Madison theme makes good use of white space as well as the masonry layout made famous by Pinterest. 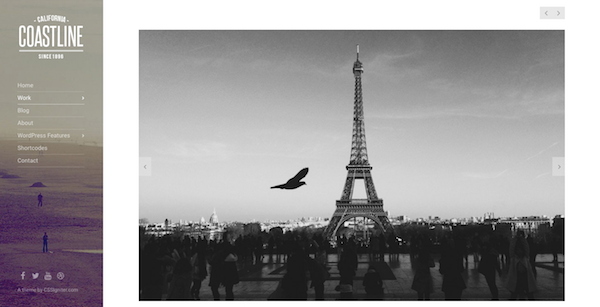 If you’ve got a heavy presence on social media, why not give your site a style to match? If you’re looking for your website to stand out from the pack, take a look at the Munich theme. On the home page, you get to a experience a smooth and very unique image/slider transition effect. And the internal portfolio pages give you the opportunity to play with dark and light. This is definitely a theme for the designer with a unique edge. Cut down on your time investment with Oshine. This theme offers 12 responsive theme designs to start from—all of which are simple, clean, and easy to follow. For those looking to customize their website by color, font, portfolio type, page layout, third-party tool integration (like forms, social media, etc. ), and more, Oshine offers that and more. If what you’re looking for is a theme that’s light on frills and keeps your photography looking sharp and click-worthy, Oyster’s a good one to look into. There’s a lot of built-in flexibility here, with different color schemes, typography, modules, gallery styling, columns, and more to choose from. Photocrati’s responsive WordPress theme is all about making the experience of setting up a website as easy as possible. With over 60 designs to choose from, users also have extensive customizations, with portfolio types, widgets, pages, and more. Additional features also give you the opportunity to enhance and optimize your website and the customer experience. 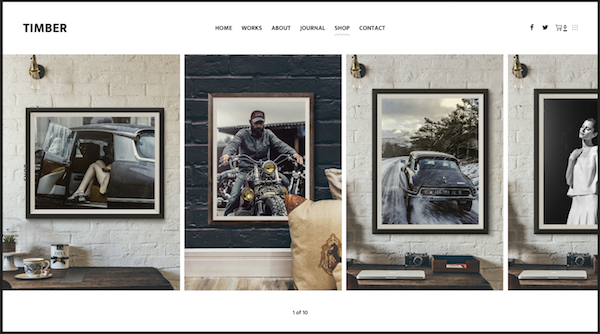 If you like the idea of telling a story with each new piece of photography you share, this free WordPress theme is a good one to look at. Resonar pays just as much attention to the quality of the content through typography and layout as it does the photography, so you’ll get a nice balance of elements. Image-heavy websites can easily get bogged down due to the weight of oversized high-resolution photography used within it. However, with a high-speed theme like Santino, you can showcase your portfolio in a variety of ways and with smooth, attention-grabbing page transitions, always keeping the visitor’s focus on the website, not on the time it takes for the next image to load. Long, infinite scrolling parallax themes are in right now. So why not make use of one? Scroller would actually work really well for the photographer working on scaling their business or for the agency looking to give their site a face-lift. The Skylab theme comes with 12 different designs, all of which give you a different layout, grid, or styling to work with. No matter which one of these you choose though, you’ve got a crisp, clean way to show off your photography. Those who want to put the focus on their photography and not have to worry about writing a lot of content around it should take a look at the Soho theme. With a fullscreen layout that works just as well for sliders as it does for galleries, this retina-ready theme makes showcasing your high-resolution images a cinch. Created by the same developer who made LENS, Timber’s theme design is simple, sharp, and edgy. If you want to build a portfolio without spending hours adjusting the minutiae, PixelGrade offers this simple solution with minimal decision-making required. 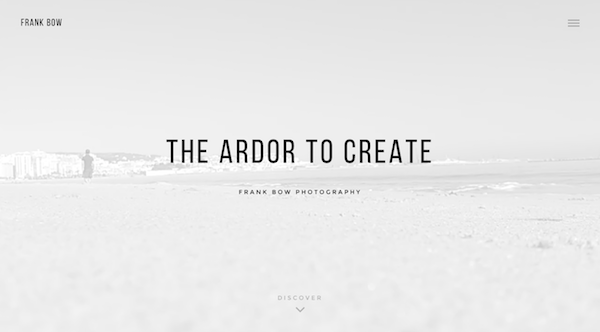 The Twofold theme isn’t just about catering to the photographer in need of a website. This theme offers you real options. With seven light, seven dark, and three collection-styled theme designs to work with, Twofold provides you with plenty of opportunity to change your mind, over and over again. For a classic-looking website, check out the full screen imagery, smooth transitions, and clean interface that comes with the Vega theme. And if you’re considering mixing a classic clean design with something a little more modern and social-media friendly, it also comes with a variety of portfolio page templates to give your galleries an extra special touch. 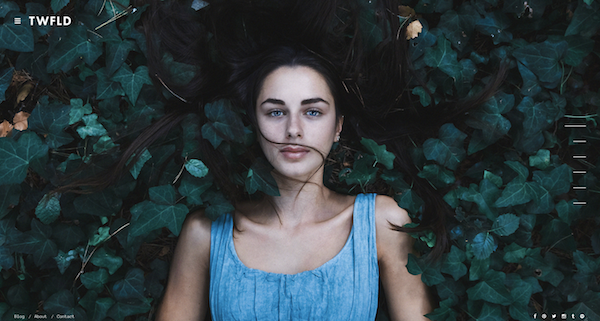 If you’re looking to get your photography noticed, it needs to stand out in today’s world of Instagram filters, oddball selfies, and stock photography littering the Internet. 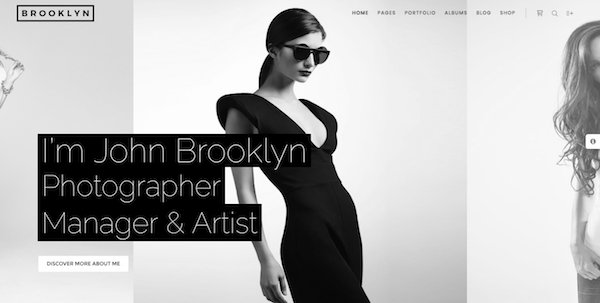 By creating a professional portfolio using one of the themes listed above, you’ll give your website a high-quality, super-polished look worthy of the photography it features. A six-year marketing veteran and a writer since the womb, Suzanne Scacca now specializes in writing B2B content for a variety of audiences. She has been published on Inc.com, Examiner, SEJ, and numerous marketing, technology, hospitality, and business blogs. When not writing about the latest news and trends, Suzanne can be found hanging out with her dog, eating way too much dessert, and watching horror movies. Avada is very complicated to manage. It’s got a lot of features, which is good but to majority of those non-coders, it’s clutter and a bunch of useless features. Divi is proving to be a good pick. Tried the demo and oh boy was I pleased. Kudos to ElegantThemes and congrats! FloThemes offer some fantastic options for photographers. I use their “Lovely” theme and love it! Also, to the best of my knowledge, the Gallery module layout grid and thumbnail size cannot be adjusted. 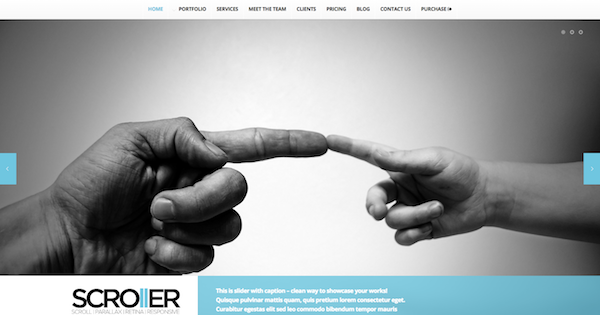 As shown in the above demo page, the thumbs are tiny (the kind of size that one would have seen on a stock photo site from years ago, not what we expect to see on a contemporary photographer’s portfolio site). It would also be great (no, make that *essential*) if we were able to choose whether the grid was one column (with big thumbs), or two, or three columns, etc., instead of being locked into using four. To improve upon the way Divi handles photo galleries, the answer should not be for Elegant Themes’ customers to have to buy and install third party child themes or plugins. Instead, ET should (finally) address the thumbnail cropping issue, and the Gallery module’s overall lack of flexibility. Does ET have any plans to upgrade these aspects of the theme? You are 100% correct. But in their defense they have had to concentrate on bigger fish. But you only know half the problem. Did you know that all your ALT-TAGS get thrown away in the galleries. DIVI galleries don’t use the alt-tag but the file name (I think). So you take all the time update the desc, alt-tag and title when you upload. All that gets thrown away. So when if comes to SEO, there is none. I would love to see a simple masonry option. But I’ve asked, along with many others, and it just has not happened. But I still love DIVI. Our site http://billandjess.com is also designed using DIVI. But to make it work great you will need plugins. Plus many of the gallery/image plugins don’t work well with DIVI. I understand plugins for SEO etc… But shouldn’t have to use a plugin for basic image handling that’s in almost every other theme on the market. Jkreativ, missing in the list above, is one of the themes acheiving this ! Avada is very complicated to manage. It’s got a lot of features, which is good but to majority of those non-coders, it’s clutter and a bunch of useless features. Divi is proving to be a good pick. Divi can be visually stunning. I LOVE Divi so much, it is my go to choice for developing sites. However it does have shortcomings. Divi needs to be able to handle src set – presently it doesn’t. (Come on Elegant Themes!) It needs to handle alt tags correctly. Unless overridden by the module, an image that has alt and title tags set in the media centre needs to have them automatically set when the image is used on the page. Image gallery thumbnail displays could do with major tweaks/more options. I agree Stephen. For 2 years I’ve been saying this and for 2 years I keep getting, “we are aware and working on it”. Looks aside, the dropping of alt-tags, when they exist is MAJOR. Of course that’s an SEO issue and they are not concerned as much about SEO. I spent hours in the WP media module, updating all the title and alt-tags, only to find that they were ignored with creating a gallery. WOW! I think if everyone ask the question maybe it might be included. I have to admit, they did give me some code to put in a child theme functions file. That fixes the issue, but it should be included in the base product. 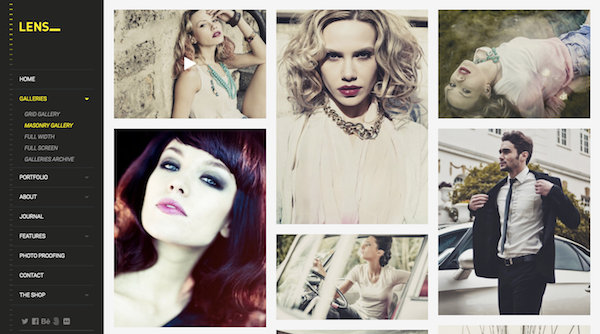 I was searching for photography theme and I found it on this great blog. Divi is my best choice. All Themes are Amazing!!!! Great and Useful information for me. Thanks for sharing with us. Thanks for putting this list together, I find it so difficult to find decent photography themes, that load quickly.